Mould growth on bathroom sealant looks unsightly and is very difficult to remove. 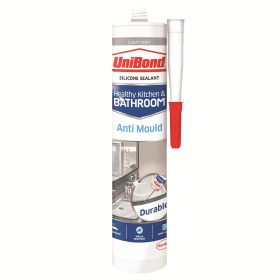 When installing a new bathroom, or shower, or basin its best to use a quality sealant that has antimould properties just like UniBond Antimould Shower Bath & Kitchen Sealant, Henkel says. The bathroom can become the most expensive room in the home when you add up the cost of the sanitaryware, tapware, and tiles so the company says it is wise to invest in the very best sealant available, which is why Henkel says that for many years, UniBond Antimould Shower Bath & Kitchen Silicone sealant has been the number one choice.